Luxury Motor yacht Jamila is a beautifully designed Italy based Aicon 64 built in 2004. Lovers of speed and luxury will find this well equipped yacht perfect for a charter vacation. She has a modern and sleek design with a cruising speed of 27 knots. 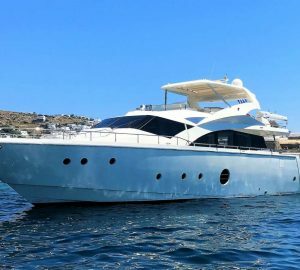 Her high performance inboard diesel engines have superior cruising efficiency making her the ideal vessel for cruising up and down the beautiful Italian Islands and coastline. Jamila has an elegant and modern interior of the highest standard which is complemented by her experienced and professional crew. Jamila offers plenty of space both inside the roomy saloon and outside on deck. Enjoy the sunshine by relaxing on either the forepeak, fly bridge or swimming platform while at anchor or cruising. Jamila has all the attributes of a first class hotel, yet has the flexibility to change location or pace as the mood changes. Jamila can comfortably accommodate 6 people in 3 cabins. There is a spacious master cabin located forward, a second large cabin with double bed, and a smaller cabin with two single beds. There are three toilets and four showers. Jamila offers large living spaces with comfortable sofas, a bar and kitchen area and a beautifully fitted command bridge. Outside there is plenty of space for relaxing and sunbathing. The innovative fly bridge has a fridge, a barbeque and folding table. The command post is located centrally to allow space forward for a huge sofa. Luxury Aicon 64, Jamila comes complete with a VHF, a Log, an Echo sounder, a GPS, a Plotter, a 12V-Net and 220V-Net, an Inverter, a Rectifier, a Generator, Warm water, Fridge and Freezer, a Dish washer, Stereo-CD and Colour-TV, Air conditioner, Heater, Cockpit Shower, Cockpit Table, Boarding ladder, Sun tent, Sprayhood, Sun cushions, and a Tender with an Outboard engine.